Meet your private English-speaking guide and driver at the exit of the airport. The guide will hold your name sign for you to recognize. After some fresh-up, visit the old Buddhist Six Banyan Tree Temple, which is famous for the graceful Flowery Pagoda inside. Go on to the renowned Huacheng Square shopping mall. Continue our cultural sightseeing in the city. Come to Chen Clan Academy, the largest, most beautifully decorated and best-preserved traditional architecture in Guangdong. 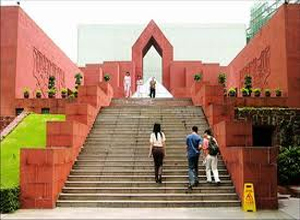 It also serves as Guangdong Museum of Folk Arts and Crafts. Move on to Sun Yat-sen Memorial Hall, an traditional style octagon-shaped building in Guangzhou. It was constructed with funds raised by local and overseas Chinese people in memory of Sun Yat-sen who overthrew the last feudal dynasty and brought China into modern times. The Nanyu King’s Tomb Museum is a worthy visit to know more about the ancient Han dynasty. Finally, shop at the famous Beijing Road Pedestrian Street. Start today’s tour at Yue Xiu Park, the largest park in downtown Guangzhou, a perfect combination of cultural relics and ecological tourism. Continue by the visit to the Zhujiang New Town with many outstanding modern buildings. Move on to the scenic and historical Lizhiwan Creek scenic spot. Stroll at the traditional Qingping Market to shop. It is specialized in agricultural and sideline products as well as Chinese herb medicines. Head for the large Huacheng Square, a renowned shopping destination as well as a scenic spot. Hotel to airport transfer. End of our service.